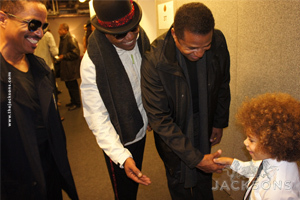 On October 8th, 2011, The Jackson Family joined 50,000 fans to rock to the hits of Michael Jackson at the Millenium Stadium in Cardiff, Wales. The “Michael Forever Tribute Concert” was organized by MJ’s mother, Katherine Jackson, and hosted by the talents of Fearn Cotton and Jamie Foxx. The star-studded line-up, including artists such as Cee Lo Green, Christina Aguilera, and Gladys Knight, kept the crowd energized and mesmerized all night. Amidst the controversy in the timing of the show, it was an incredible gesture in celebrating the life of Michael Jackson and all he offered to this world. At one point all three of Michael’s kids took the spotlight on the glove shaped stage. “We’re very happy to be here on this special night to honor our father,” said Paris.